I believe that Maersk is Danish. 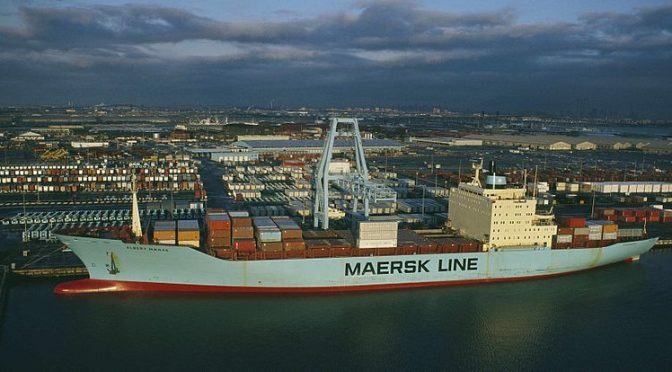 Lars, during a tour of the Miami container port many years ago the guide made exactly the same mistake, claiming that Maersk was based in Amsterdam. So, deja vu all over again! I was curious about your LORAN comments, since North America took it offline in 2010 and much of the rest of the world shut theirs down by 2015. There is interest in the US and other countries in adopting eLORAN (enhanced LORAN), which operates on the same principles as LORAN did, but with a smaller footprint, less maintenance, and more accuracy – +/- 8 meters, which isn’t quite good enough for precision missiles, but will certainly tell you if your ship is in the wrong part of the ocean. There has been increasing R&D in the military services around modernizing & automating traditional navigation techniques to avoid GPS jamming concerns. For example, using sensors to automate celestial navigation. Advancements in technology enable sensors to conduct celestial observations both day and night, in a wide variety of environmental conditions, with far greater accuracy than human observations. The commercial industry will follow suit when the economics of their business demand they do. Efforts to protect maritime shipping from cyber attacks must be a public-private partnership.